Where will milk price go? Fonterra will announce its forecast payout for the 2014/15 season next week. 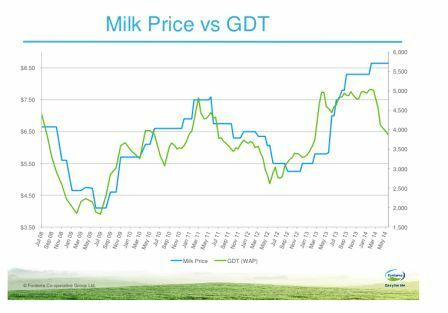 The milk price has shadowed the GDT price index until the last few months when the index has fallen but the payout has remained higher. Even the most optimistic forecasts for the coming season indicate a fall from the 2013/14 record payout. This graph reinforces that and there’s speculation the new season’s inaugural forecast could be down by more than $1.50, to $7 per kilogram of milk solids (kg ms).
. . . BNZ economist Doug Steel said a lower payout forecast was unlikely to surprise farmers, given highly visible declines in world prices to date. Given current price and currency conditions, a milk price forecast somewhere around the $7 kg ms mark seemed plausible, Mr Steel said. ”This [latest decline] fits within our view that dairy prices would be lower this year,” he said in a statement. Westpac chief economist Dominick Stephens also believed the new season payout forecast next week would be well down, at around $7.10kg ms, while also picking the present season forecast would be downgraded, from $8.65 to $8.50kg ms.
Because the dairy sector carried the majority, or about 65% of all agricultural debt, and half the dairy debt was held by about 10% of all farmers, the Reserve Bank was watching the sector closely, he said. . . Wise farmers have used this season’s record payout to reduce debt and have been budgeting on a lower payout for the coming season. Remember the manufactured manufacturing crisis the opposition spent so much of their energy and our money on last year? New Zealand’s manufacturing sector started 2014 on a healthy note, according to the latest BNZ – BusinessNZ Performance of Manufacturing Index (PMI). The seasonally adjusted PMI for January was 56.2 (a PMI reading above 50.0 indicates that manufacturing is generally expanding; below 50.0 that it is declining). The sector has now been in expansion for 16 consecutive months, with the last six months also averaging 56.2. BusinessNZ’s Executive Director for Manufacturing Catherine Beard said that despite the usual seasonal effects of Christmas and the holiday season, the sector has begun the way it finished off 2013. BNZ Economist Doug Steel said it would be easy to understand if the PMI had lost a bit of heat in January, given the hefty lift in the NZD/AUD exchange rate. But the PMI has barrelled on, as domestic demand strengthens. . . .
Hon STEVEN JOYCE: Of the 16 different industries measured by the household labour force survey, employment rose in 11, including manufacturing, which does debunk another myth often heard around this building. There is no doubting that the high New Zealand dollar is a challenge for exporters, but the January Performance of Manufacturing Index, which was released today, shows manufacturing has now been in expansion for 16 consecutive months, which is, weirdly, precisely the exact same time since the Opposition announced the start of its inquiry into a manufacturing crisis. I quote from the Performance of Manufacturing Index today, which says that manufacturing punched above its weight regarding job growth in 2013. It accounted for 13.5 percent of jobs added in the New Zealand economy overall last year, which is more jobs than were added in Australia in the same period. . .
Hon STEVEN JOYCE: . . . The Government has more than 350 initiatives under the Business Growth Agenda that are helping businesses grow, because that is how employment grows. I contrast this with policies that would put a chill on industries, that would cause their hiring intentions to freeze, and companies themselves might not even survive—for example, if you nationalise the electricity industry or double the cost of the emissions trading scheme on households and businesses, or if you impose new taxes on every single business in the country. . . . The left demonise business without realising its the goose that lays the golden eggs of employment and economic growth. The recovery is real but it’s not yet robust and a change of government with policies that would undermine business confidence could easily reverse the hard-won progress that’s being made. New Zealand manufacturing expanded at the fastest pace in eight months in January, but employment in the sector is shrinking. The BNZ-Business New Zealand Performance of Manufacturing Index climbed 4.8 points to 55.2 last month, the highest since May last year and the highest for the month of January since 2007. The survey showed the strongest sector within manufacturing was in non-metallic mineral products, which stood at 77.5 and probably reflected demand for concrete, especially for the Christchurch rebuild, said Bank of New Zealand economist Doug Steel. “Over the coming years we anticipate the positive flow-on effects of a stronger construction sector, and not only in Canterbury, to broaden to other parts of the manufacturing sector,” Steel said. Production was the strongest of the five seasonally adjusted diffusion indexes within the PMI, with a reading of 57.7 last month, the survey shows. On the PMI scale, a reading of 50 separates contraction from expansion. Deliveries were at 57.6 and finished stocks on 56.1, the highest since October 2007. New orders rose to an eight-month high of 55.8. By contrast employment slipped to 48.4, marking the eighth straight month of contraction. Manufacturing is expanding but jobs in the sector are declining. That shows that, contrary to claims by Opposition parties which are wasting money on an inquiry into the manufacturing “crisis” that there is no crisis in manufacturing. The problem is in employment. If manufacturing is growing while jobs are declining it suggests growth in productivity which is good but it is often based on improved technology and more mechanisation. The down-side of that is fewer people are required for the work. The solution isn’t to subsidise manufacturing it’s to help train people for different jobs. The rise in the New Zealand PMI contrasts with that in Australia, which sat at just 40.2 in January, for the widest gap between the two nations since the New Zealand index was started in 2002. This might seem like good news for those focussed on Trans-Tasman rivalry. But Australia is our biggest trading partner and any indication its economy is faltering is a concern for us. Like blood to the body, agriculture is critical to the NZ economy. The sector makes economic contributions in direct and indirect ways, although measurement of such can be a tricky business. The latest national accounts show agriculture GDP growing 7.5% through the year to March 2012. This supported the 2.4% expansion in the New Zealand economy over the same period. . . The importance – and potential – of China as a market for the red meat industry was reiterated during the recent red meat sector conference in Queenstown. Arron Hoyle, McDonald’s senior director and head of strategy in China and Hong Kong, said the dragon was redesigning global trade and global prices. He spoke of the “unprecedented” urbanisation in China, the emergence of mega cities and the significant opportunities the fast food chain saw. It was bullish and very excited about those opportunities. . .
Meat Industry Association chairman Bill Falconer believes the red meat sector strategy has been “settling down extremely well” since its launch 14 months ago. The strategy, initiated by the MIA and Beef and Lamb New Zealand, was aimed at improving the sector’s viability and increasing its earnings from $8 billion to $14 billion by 2025. . .
NZPork chairman Ian Carter has challenged those attending the industry’s annual conference to recognise themselves as “the best little pig industry in the world”. “Pork is the world leader in animal protein, but only number three in New Zealand. “Our target must be first place,” Mr Carter, a North Otago farmer, said. . .
Sheep and beef farmers were the biggest agricultural earner in the Clutha district but dairy farmers were a close second. The latest statistics from the Clutha Agricultural Development Board (CADB) says sheep and beef farming earned $313 million and dairy farming $276m for the year ending June 2011. However, a steady five-year growth spurt in dairying had the Clutha herd increasing by 30 per cent to 98,543 cows. In the same period sheep numbers dropped 14 per cent to about 2.17m. . . Entries for the 2013 Ballance Farm Environment Awards open on August 1, 2012. Administered by the New Zealand Farm Environment Trust (NZFE) and operating in nine regions, the annual competition promotes sustainable land management by showcasing the work of people farming in a manner that is environmentally, economically and socially sustainable. NZFE chairman Jim Cotman says this website has been upgraded to make it easier for farmers to find information on the Ballance Farm Environment Awards and the Trust’s other activities. . .
At times of rising food prices, the rest of the world must look at NZ and see strong growth prospects, and the benefits from the world buying our products at higher prices are shared across the economy. The NZ dollar tends to follow broad movements in international commodity prices. Among the benefits of this are lower prices for imported goods, leaving more money to be spent elsewhere. In the upshot, the effect of high international foodprices is a net positive for the economy. “To think otherwise, would be like thinking higher oil prices are a negative for Saudi Arabia. It would just not make sense.” Economist Doug Steel in Trans Tasman. At the start of last year sheep and beef farmers looked enviously at the returns dairy farmers were enjoying and aimed to get prices for meat, wool and other by-products which matched those from milk. The gap between sheep and beef returns is closing on those from dairying but that owes more to the fall in the price of milk than improved prices from cattle and sheep. Fonterra has already announced a drop from its opening forecast of $6.60 a kilo of milk solids for the season to $6 and is expected to announce a further fall at the end of the month. The average price the company got at its internet auction on Tuesday was $US2017 ($NZ3420) per tonne which was 9.3% less than the average in December. The only glimmer of hope is a small rise in spot prices which might indicate prices are reaching the bottom of the cycle but that’s small comfort when the global price for milk, which peaked at the end of 2007, has fallen sharply since September last year. The state of global commodity markets isn’t the only problem facing Fonterra which just 12 months ago was being held up as the example the sheep industry should follow as the benefits from the white gold flowed through rural communities and into the wider economy. The on-going fallout from its investment in Sanlu, one of the company’s hardest hit by China’s poisoned milk scandal continues. Sanlu was declared bankrupt by a Chinese court on December 24th and the way the company has handled the issue doesn’t give me any confidence that it has learnt enough to ensure success in any future investment in China. However, the financial losses from the Sanlu investment have already been taken into account and disappointing as Fonterra’s payout is expected to be it’s unlikely to fall as far as that of Westland Dairy Co-operative. It’s reduced its forecast payout for the season from the $5.20 to $5.60 a kilo of milk solids announced in November to $4.10 to $4.50. Making matters worse is Westland’s decision to backdate the forecast meaning suppliers have to pay back money already received. The reduced payout will mean suppliers will receive $180 million less than expected. To bring that down to an individual farm: the owner of a 350-cow herd received $90,000 for his milk from Westland last month and had budgeted on getting $120,000 for January but is now expecting just $30,000. Lincoln University professor Keith Woodford said that given Westland’s position that Fonterra is unlikely to to achieve a payout of more than $5. Westpac economist Doug Steel has a more positve view and thinks Fonterra could still achieve a $6 payout. However, the company could do well to follow the advice given to politicians to under promise and over deliver because a lower forecast might help to stabilise or even reduce some of the production costs which rose further and faster than last season’s record payout. The whitegold has tarnished but most commentators are still confident that the longterm outlook for dairying is positive for those who are able to farm there way through the current lower returns. Established farmers with good equity will be disappointed by the drop in income and may have to tighten their belts but it shouldn’t threaten their businesses and they’ll be helped by the fall in interest rates and the cost of fertiliser and fuel. Those most at risk are the ones who have just converted or are in the process of converting for next season who bought land and stock at peak prices; and sharemilkers who bought cows in the middle of last year when values were highest. However, while the payout obviously has a big impact on financial performance it’s not the only factor to affect profitability. A speaker at a SIDE (South Island Dairy Event) conference a couple of years ago said he’d had a better result for the year when the payout fell to $3.60 than he had the previous season when it was above $5 because he’d kept a tighter rein on costs when the payout was lower. P.S. – Cactus Kate, Macdoctor and Inquiring Mind have posts on Fonterra and Sanlu; and Fran O”Sullivan is not impressed by the way the company has handled the issue.